Home / Wordpress / Why would you want to use WordPress to build your website? Have you ever heard website owners complain about being charged to change a small thing in your website? These kinds of frustrations are quite common regarding the development of website. You can avoid these things if you take precaution from the very start. How do you take this precaution? It’s easy you should hire a WordPress Development Company to build your website using WordPress. This should solve your above mentioned problems. Of course, when you hear someone say well about something then you would want proof to prove it. Here are few points that will provide you with all the proof that you require. WordPress is the perfect Content Management System (CMS) that can help you to build a good and user friendly website. A CMS is the perfect tool to manage your website and update it. You can write articles or change the image without any problem or hitch. You won’t have to go to web designers to make small changes to your website. This will say you from the extra cash that you will have to throw away to make minuscule changes in your website. WordPress offers SEO for your website for free. This is an extra benefit for you and your website. 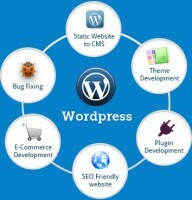 You can also ask the WordPress Development Services to help in proper optimization of your website. So, if you choose WordPress you will receive SEO as an extra gift package along with other features. With WordPress you can easily upload contents to your website. You don’t need to have extensive knowledge about programming language to upload contents of your website. Once the WordPress Development Company sets up your website, you will no longer have to contact them to change images, upload new articles or make small changes. You will be your own master and you can do as per your wish without asking anyone for help. WordPress has loads of features and themes that are ready to be used .These features and themes are either freely available or cost some money. Many developers are constantly creating new themes and plug-in for the WordPress which you can take advantage of. These features will make your website look even more cool and attractive. There are many WordPress Development Services that are waiting to serve you and take you the tour of WordPress world. It is easy to install, use and update. Even the people who have zero knowledge about programming language can easily maneuver through the website and make some small changes. Thus you will no longer have to fall in the trap of web designers who charge you high amount just to make few changes in your website.